Chemical properties are characteristics of a material that become evident when the material undergoes a chemical reaction or chemical change. People cannot observe chemical properties by simply viewing or touching a sample of the material; the actual structure of the material must be changed in order for people to observe the chemical properties. Chemical properties can only be established by changing a substance's chemical identity, and are different from physical properties, which can be observed by viewing or touching a sample. Flammability - How easily something will burn or ignite, is a chemical property because you can't tell just by looking at something how easily it will burn. Fire testing is done to determine how difficult or easy it will be to get a certain material to burn. Information about flammability is used in building codes, fire codes, insurance requirements, and storing, handling, and transporting highly flammable materials. Heat of Combustion - This chemical property is the amount of energy that is released as heat when a substance is burned with oxygen. Examples of this chemical property is a calorie which converts to energy within the body and the amount of heat generated by the burning of various fuels. Toxicity - How much a substance can damage an animal, plant, cell, organ, or other organism is its toxicity. Materials with the chemical property of toxicity include lead, chlorine gas, hydrofluoric acid, and mercury. Toxicity is measured by how the lead, chlorine gas, mercury, or other substance affects the organism - basically, by how much damage it does to the organism and how quickly that damage occurs. For example, lead is a toxic substance that can damage various parts of the human body, including bones, the heart, kidneys, intestines, and the nervous and reproductive systems. Ability to oxidize - This is what takes place by gaining oxygen, losing hydrogen, or losing electrons, and is a chemical property that results in the oxidation number of a substance being changed. An example of this is rust. Over time, iron and steel (which is made of iron) will rust. However, they will rust more quickly if they are combined with pure oxygen. 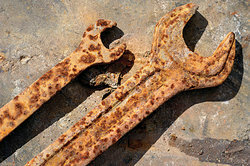 Examples of oxidation include the way an apple turns brown after it has been cut, the way a penny turns green, and the way a fender on a car can become rusty. Radioactivity - The emission of radiation from an atom with an unstable nucleus, is a chemical property. On the periodic table of elements, the elements that have no stable isotopes are considered radioactive. Some of the most radioactive elements are hydrogen, beryllium, carbon, calcium, cobalt, zinc and iron. Chemical stability - This chemical property in a given environment, also referred to as thermodynamic stability of a chemical system, refers to the stability that takes place when a chemical system is in its lowest energy state - a state of chemical equilibrium, or balance, with its environment. This equilibrium will last indefinitely unless something happens to change the system. Half-life - This chemical property is the amount of time it will take for half of the original substance to decay. It is used in nuclear chemistry and nuclear physics to describe the time required for half of the unstable radioactive atoms in a sample to experience radioactive decay. Each of these are chemical properties. Now you can better understand what a chemical property is. "Examples of Chemical Properties." YourDictionary, n.d. Web. 23 April 2019. <https://examples.yourdictionary.com/examples-of-chemical-properties.html>.